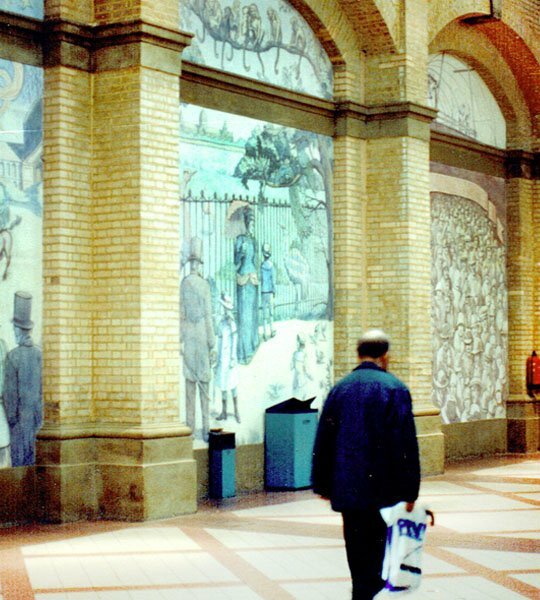 Thirty years ago, in 1987, I embarked on my first major public arts commission, the Alexandra Palace Murals, so I thought it was about time I wrote it up…. 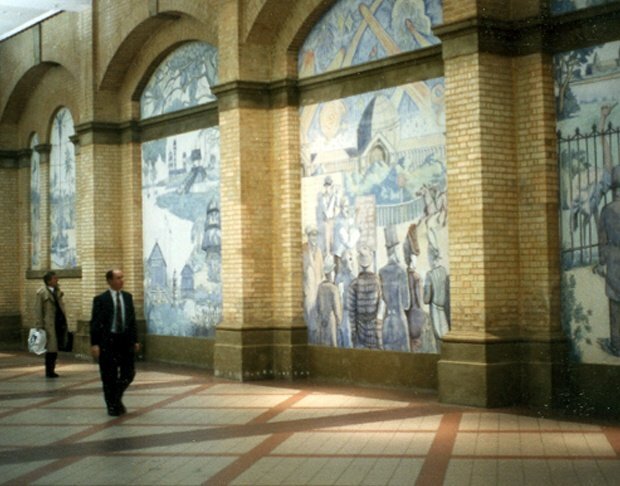 This large series of murals were painted as part of the major redevelopment of Alexandra Palace in 1987, following the fire which devastated the palace in 1981. 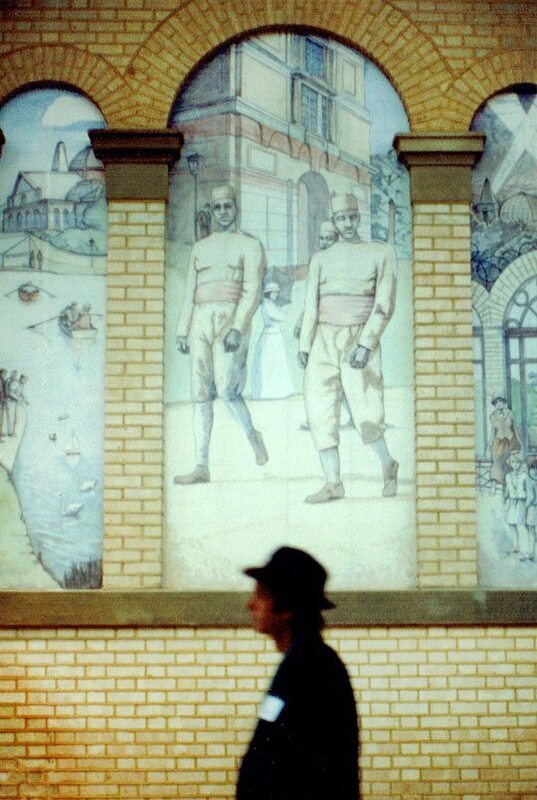 The Alexandra Palace Murals depict the History of the ‘Peoples Palace’ and were painted by ‘Haringey Mural Workshop’. 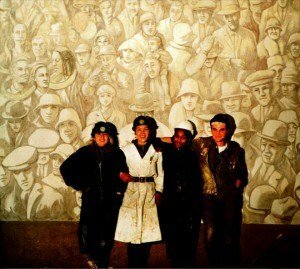 The Workshop was a public arts team set up by myself and Ruth Priestly from former members of a Hospital Mural Project we were working on, based in Tottenham in North London. Haringey Mural Workshop was modelled on Greenwich Mural Workshop in my home town of Woolwich and consisted of myself and artists: Ruth Priestley; Hilary Leobner; Jo-Ann White; John Beaumont. 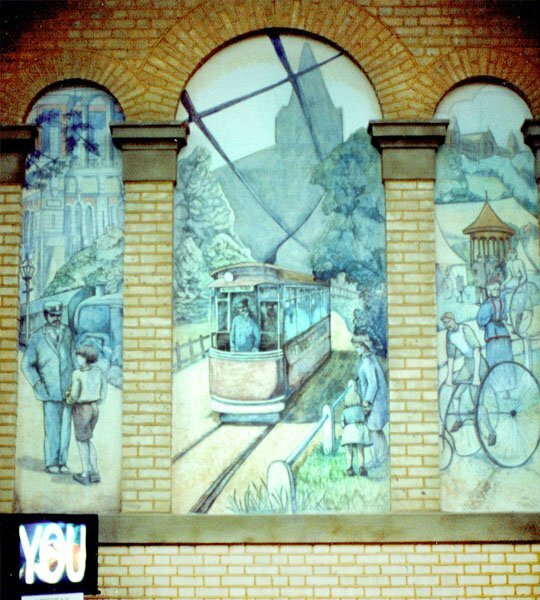 The Alexandra Palace Murals were painted in Keim Mineral Paints, probably one of the most durable and permanent paints available. The images were collected from historical research from contemporary illustrations, photographs and descriptions in the palaces own extensive archive and that of the Bruce Castle museum in Tottenham. 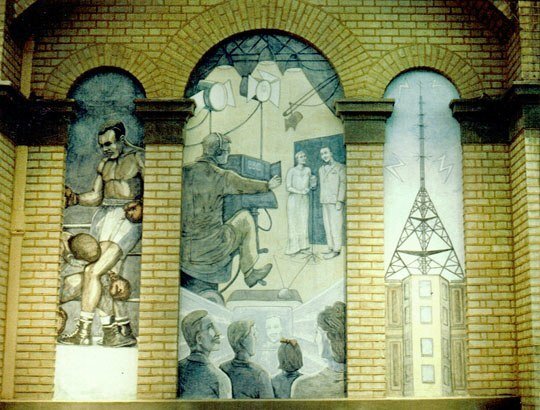 Three months were spent working into the night by spotlight and over weekends to finish the murals in time – the only contractors in the vast rebuilding programme to do so. The Peoples Palace was planned as a palace for the people of North London after the success of the Crystal Palace. Construction was completed and the Palace for the People officially opened for Queen Victoria’s birthday in 1873. Tragically the first palace burnt down just 16 days after the opening. The palace was then rebuilt and re-opened in 1875. 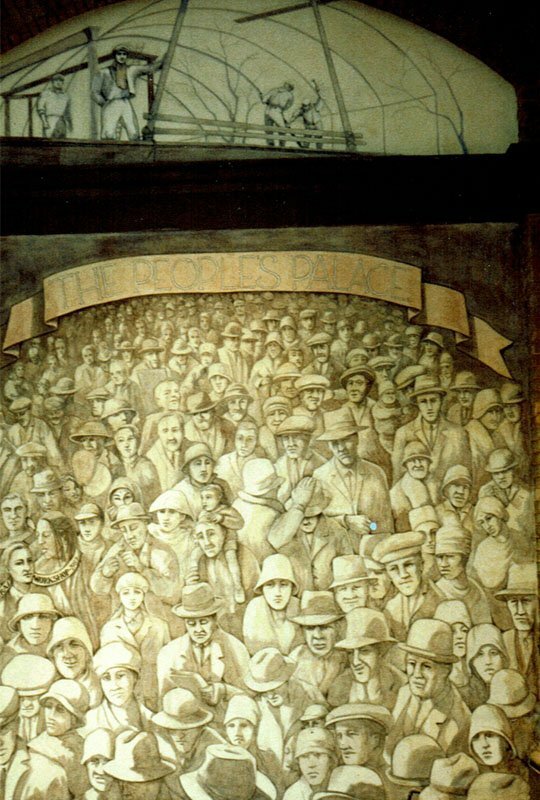 If you look in the crowd scene on the centre left edge you will see a youthful self portrait of myself and the other artists. Gardens covering 220 acres were laid out by Alexander McKenzie, at the time of opening the zoological gardens were a fascinating site. Featuring exotic animals such as ostriches and apes, today it seems that the Victorian visitors in their bustles and top hats are somewhat exotic. The Famous Frying pan was the name given to the race course which once stood at the foot of the hill directly in front of the palace. Behind the racecourse you can see an impression of the first palace, designed by Edward Meeson. The central dome measured some 170 ft in diameter considerable larger than the Pantheon or St.Peters in Rome. Above the palace we see fireworks lighting up the sky, perhaps the same display that celebrated the battle of Balaclava in 1875. Splendid Victorian Gardens surrounded the palace which included various novelties. A Japanese village was brought from Vienna and erected by Japanese workmen on the site of the present grove carpark. A number of ornamental lakes one of which contained a village on stilts and a swiss chalet. 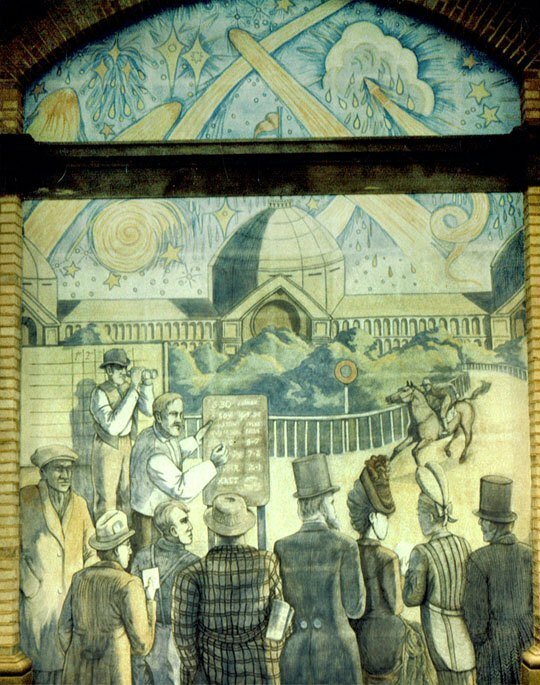 It was Owen Jones, (responsible for the interior of the crystal palace), who first floated the idea of a Peoples Palace and this panel represents one of the earliest designs for the palace. Later a domed conservatory in the second palace, housing exotic plants reflected this original vision, the present palm court. The second palace was filled to the brim with a collection of art, artifacts, natural history and ethnology that was typically Victorian. Fire first struck the palace just sixteen days after the opening, the palace was destroyed due to the height of the dome and the low pressure of water on top of the hill. Despite inadequate insurance plans were submitted for reconstruction almost immediately, estimated at £232,000. The new palace was opened on 1st May 1875 just two years after the destruction of the first palace. This time the new design incorporated tall corner towers holding huge water tanks, just in case! The Willis organ, driven by two steam engines was a central feature of the new palace. 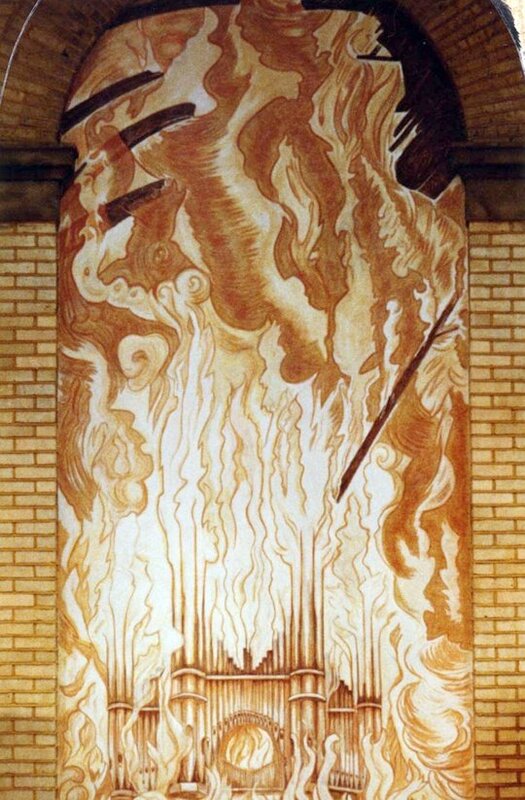 However it was this organ whose pipes sucked the flames up and across the ceiling with devastating effects in the second fire. The second fire devastated the palace in July 1980. With the rebuilding of the new palace no chances were taken on a third fire, a gypsy charm was buried in the new foundations to ward off a curse that was said to haunt the building. Dolly Shepherd was just one of the balloonists, parachutists and acrobats who drew the crowds on bank holiday festivals at the rebuilt palace. Dolly has was an amazing daredevil, and a pioneer of parachuting and early hand gliding experiments… And yes, there was no body harness in those early days. 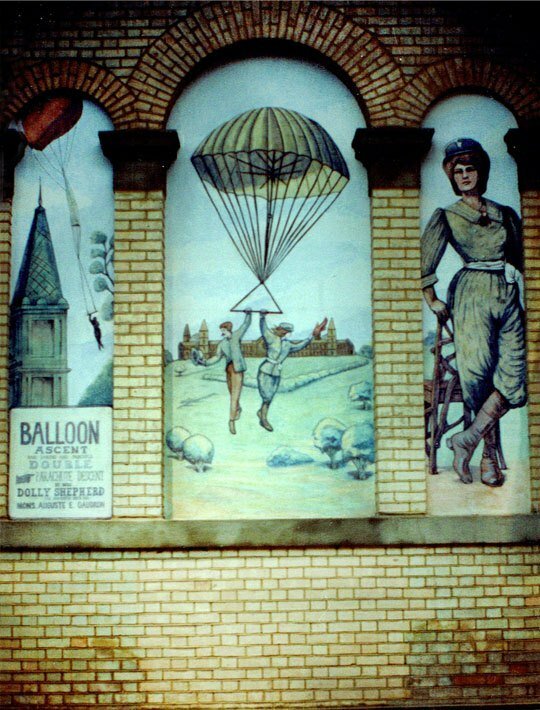 Parachutists like Dolly were lift by balloon into the sky and then released hanging on with just a trapeze like bar and a sling around their legs. Dolly is also credited with the first mid-air rescue when her fellow jumper got into trouble, a rescue from which she was severely injured. Three different transport related aspects are shown here. The railways featured in the palace from the beginning with the construction of a branch line from the Great Northern Railway at Highgate the route can now be traced along the “Parkland Walk”. A cycling track was an early attraction to the park. The central section shows the electric tram service introduced to the palace in December 1905. The central section here shows the celebrations for the birthday of George V when troops from across the Empire gathered at Alexandra Palace. On the outbreak of the First World War the Peoples Palace was closed off, barbed wire and sentry turrets erected as the Palace became in internment camp for British residents of German and Austrian descent. Later the palace was used to house Belgium refugees and then German POWs. The rollerskating ring was opened in 1876 a constant feature of the palace the roller skating ring was also the only entertainment to remain open during World War II. The Boating Lake is one of the few features in the park that have survived. In 1934 the BBC moved in to the East Wing of the Palace to make the first television transmissions, two studios were built one for the Marconi system and one for the Baird, the latter was abandoned. All programmes were produced at the palace and apart from a pause for the war production continued until 1956 after which the palace was used exclusively for news broadcasting. Part of the televising included boxing bouts, and the British Boxing Association still has links with the palace today.